The Syrian Crisis has been raging for over two years and the focus of both the media and academia has primarily been on the political aspect. Yet, this crisis is not one that is just political. It also has a human rights dimension and can be seen as a humanitarian crisis. International NGOs have reported human right violations occurring within Syrian, by both the Assad regime and the opposition forces. The statistics regarding casualties, internally displaced peoples, and refugees are staggering. The international community has yet to reach a consensus on action and is still struggling on how to handle the crisis. Syria quickly devolved into a civil war and death tolls are mounting. Assad has once again taken the upper hand as the opposition forces have become further fragmented and there have been reports of skirmishes between different factions of the opposition forces. This is a complex conflict; it is not simply black and white. In order to fully understand what is happening in Syria, every aspect of the conflict must be considered including the actors both inside and outside the state. Each of the panelists explores the Syrian Crisis through different experiences and makes recommendations accordingly. 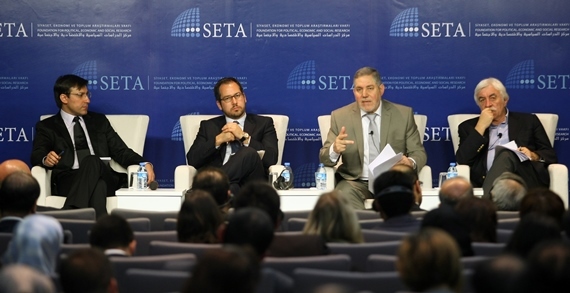 The Policy Debate is based on a panel discussion on “the Human Cost: Syrian in Crisis and Human Rights,” organized by the SETA Foundation in Ankara, Turkey on April 26th, 2012. The panelists included Walid Saffour, president of the Syrian Human Rights Committee, Nadim Houry, the deputy director of the Middle East and North African division at Human Rights Watch, and Cengiz Çandar, a journalist for Radikal Daily. The discussion was moderated by Talip Küçükcan, Director of Foreign Policy Research at SETA. The speakers addressed the following questions: What are the accusations against the Syrian authorities? Do the human rights NGOs in Syria and the world have the capacity to uncover and report human right abuses? What is the role of international organizations in stopping the violations in Syria?